The MistTime 10 output misting controller offers advanced features in a basic control. The MistTime has four modes of operation: it can operate cyclically on a 24 hour basis, between certain hours, above a set temperature or based on time and temperature. Additionally, a manual cycle for any valve can be run at any time, with the controller reverting back to the last program immediately afterwards. 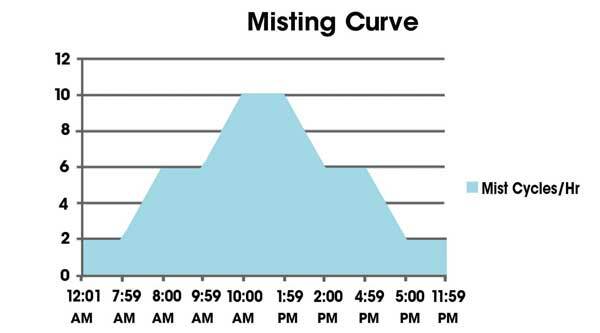 The controller has the advanced option to build a mist curve that changes the misting cycle throughout the day. Using up to six time buckets, users can build a basic curve to increase and decrease the misting frequency. The MistTime is easy to program, using a text based display and can be programmed in English, Spanish, French or Dutch. The MistTime10 is easy to program. This video highlights setting up both basic and advanced features. 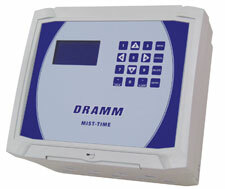 The Dramm MistTime Controller is perfect for time or temperature based control of misting valves. With the ability to program each valve independently, the MistTime offers unmatched flexibility. Each valve is operated on a cycle. The timing is variable with the duration operating between 1 second and 60 minutes and the interval time operating between 1 minute and 12 hours. Each valve can be run continuously, between specific times, or even started when the temperature rises above a set point. With the ability to program each valve independently, the controller can operate as a time based mist controller, a pulse-irrigation controller and a mist cooling controller at the same time. 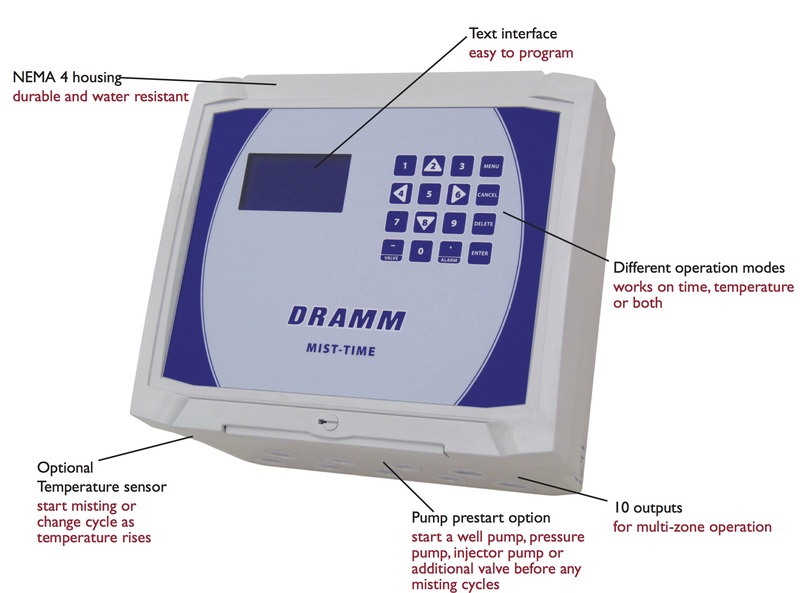 In addition, the MistTime offers the option to convert the last valve output to a pump pre-start output. When configured in this manner, the operator is given an option to pre-start a pump prior to any valve operation. The pre-start time is variable. This ensures that the system is properly pressurized when the mist system is in operation. The MistTime is easy to program using a keypad to navigate the menu and enter amounts. For flexibility, the MistTime can be programmed in English, Spanish, French or Dutch. The MistTime operates on 120vAC or 220vAC and includes a 24vAC output. The unit is enclosed in a NEMA 4 rated PVC housing and is easy to wire and install. The MistTime is programmable in English, Spanish, French and Dutch. This manual offers native language support.